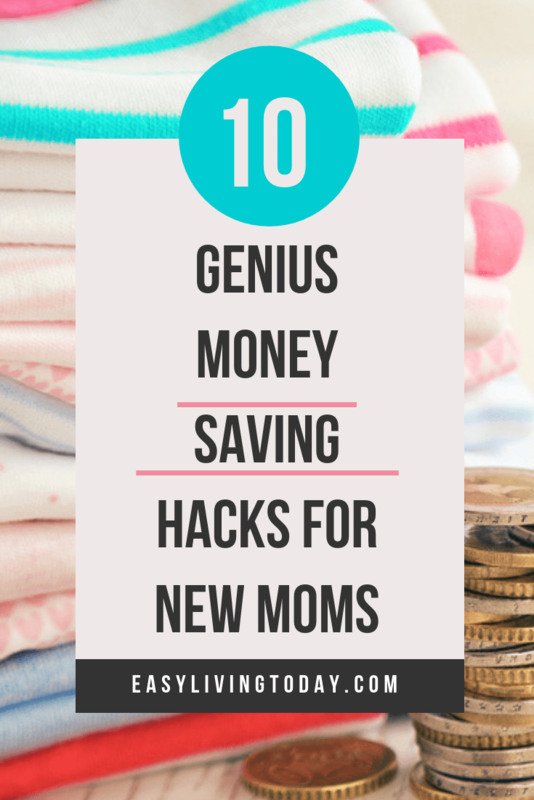 The other day I was thinking about how my babies didn’t turn out to be as expensive as people made it seem, but then I looked back and realized it was because I’ve been using a these 10 money saving hacks that not everyone does. Let me tell you, every single one is worth it! You can save so much money if you just do these 10 things. Yes, you’re going to have to let some bougieness go… but if you’re looking up money saving hacks then it’s time to let that go! So let’s save some money, honey! Use a brand like Luvs or a store brand when you buy diapers. They work just as well as the more expensive brands, I promise. We, personally, have Luvs on our subscribe & save plan so it’s even cheaper. We pay $23/month for diapers for two little ones. Before that we were spending triple on a more expensive brand. Now I’ll never go back because our wallet can really feel the savings. Use the Dosh app for cash back for products you buy BOTH in store and online. It reads your purchases from your card, not via links. So whenever you swipe your debit card, or whatever card you attach to the app, it reads your purchases and gives you money back, usually 5-10%. Then you can transfer that money to your bank account. So it’s basically like constantly using coupons… without having to actually use coupons. It’s also super safe like Paypal, so no worries. Plus, it works at restaurants and stuff too. Double up on cash back when you shop by also using ebates on top of Dosh. You can easily get 20% back this way. But, ebates only works for online purchases. Still, it’s good to have both because it’s basically an effortless way to get money back on things you buy. Marie Kondo your life up. I swear getting rid of things I never used the way I thought I would really slowed down my spending and made me rethink every single purchase after “tidying up.” I recommend doing this before baby comes, because it’ll be much harder to find the time once baby is here. Also, it help you cut some bad habits before the baby comes and you form more spending habits on top of the ones you already have. Consider cloth diapers and wipes. This saves thousands of dollars, but it’s also more work. You can read cloth diapering 101 here. Cloth wipes are super easy to use, though. 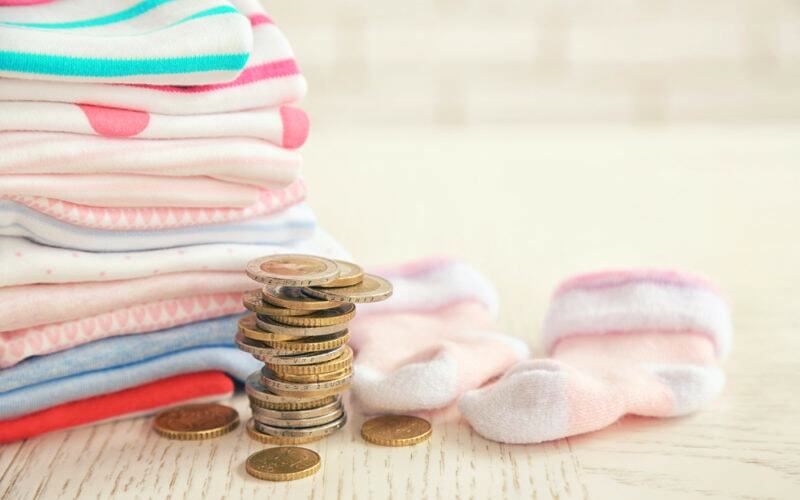 Sell baby stuff as your kids outgrow it (unless you’re planning to have another soon after). You can easily sell used baby stuff in your neighborhood garage sales on Facebook or on Craigslist. I personally find the Facebook garage sale groups easier to use and safer. Tip: Just go in to the Facebook search bar and type in your neighborhood + garage sale, you will likely find a bunch of for sale groups in your area this way. Buy baby stuff that is lightly used on those same Facebook garage sale sites. You can find things like pack and plays, cribs, rockers, etc, for a fraction of the cost! Just ask for necessities at your baby shower. It’s easy to fall in love with a ton of cute things, but you’ll likely just collect a bunch of stuff you’ll never use. You’re better off asking for gift cards or things that you’ll definitely need consistantly (diapers, wipes, a handful of bottles, stroller, car seat, etc). But, trust me, you do not need fancy towels, a million blankets, 10 diaper bags or three tubs. Buy furniture at Ikea. The quality is great and you can get it for like 1/5 of the price. It also looks really good and modern. I mean, why pay $500 for a crib when you can get one for $130? You can even get a $40 mattress and $10 crib sheets. That’s everything you need for less than $200!